The article Signals in the ELF-Range Part III-2 described the different types of strong, clear and complex signals that can be received in the frequency range below 25 Hz in populated areas. When this article was written, the radiation source of the signals was not yet discovered. As I know a little bit more about this topic now, I think its time to write a short update of my latest work, which wouldn’t have been possible without the contribution of Franz Peter Zantis, who developed the electronic circuit for that fantastic receiver I use. Also many thanks to David Hine who inspired and encouraged me by a lot of interesting thoughts, hints, links and good ideas. In 2011 I purchased a small Windows-7-Netbook that is able to run for more than 4 hours with its batteries without being recharged. In addition, I used a new receiving software that was programmed by Franz Peter using Visual Basic 2010 Express in combination with .net framework 4. As battery driven receiver, I use a high gain preamp, followed by a 36 dB per octave Sallen-Key low pass with a cutoff frequency of 25 Hz. The signals in a range between zero and approximately 25 Hz are fed into a modulator that modulates a sine carrier of 200 Hz with the ELF signals. With this method, you won’t have any problems with the frequency response of the soundcard of your notebook or PC. The VB-software demodulates the signals again and saves them at the hard disk. As a result you get a wave audio signal sampled by 200 Hz. You can make it audible by “telling” your playback software, that it was recorded by 32000 Hz. In addition you can see the FFT versus Time analysis of the signal when using an appropriate software. As described in former articles, the signals in question can be received in small villages and big cities, but until now they never were detected out in nature like agricultural fields, grassland or forests. In addition, the signals can be received by coils and also by using probes put into the ground. Why is each transformer emitting its own, typical patterns of ELF signals? If the transformers emit these signals, why can’t they be detected at the 230 V power network within private homes? Facing these two questions, I tried to create a theory to answer them. To find out if that theory is right, I would need more information about the wiring of the transformers in question within populated living or industrial areas, which doesn’t seem to be easy to find in the web. So if some reader knows more about this topic, he’s welcome to write to my mail address published at the end of this article. As each of the transformers in question sends out different signals, these signals must be created locally in the environment of the transformers. If they would come to the transformers via the primary high voltage network, they would be the same at each transformer because these are all connected to the same source. The range of some signals goes down to less than 1/3 Hz. Commercially used power line control signals are of much higher frequencies of 100 or more Hz. The signals can’t be created by superposition of higher frequencies because the modulation frequencies are very low and sometimes in the range of hours. So they better match to very low than to high frequencies. In addition, the receiver cuts off all frequencies higher than 25 Hz with 36 dB per octave. These signals are partly listed and described in the article mentioned at the top of this one. Meanwhile, a lot of new signals have been added to this list. A description of these new signals will be too long for this short overview. So if any reader may be interested, he can contact me via the appropriate E-mail address shown and the end of this article. Even if I cannot tell who or what is producing these signals, I at least have a theory about the mechanism they are radiated: In the web I recently found an article about the “Peterson” Coil, which is used in power stations to protect the circuit against natural outdoor short circuits like trees falling at power cables and comparable events. This coil is, as I understood, mounted between the ground and the supply transformer (see image 1). Now my idea: If the signals are created by some unknown sources that are located in the ground, then the ground works like a generator whose two poles are connected with the Peterson coil. The current flows over the mass contact of the coil through the coil and back to the other edge of the “ground generator” via one of the power cables. What makes me wonder is the fact that those ground currents then must be strong enough to produce a magnetic radiation by the Peterson coil that can be received up to a distance of 100 meters from the coil by a sensitive equipment. The theory, if it is right at all, may tell us how the radiation could be possible, but not who or what’s responsible for the signals themselves. By the way even after more than ten years of web research I couldn’t find any information about these signals. 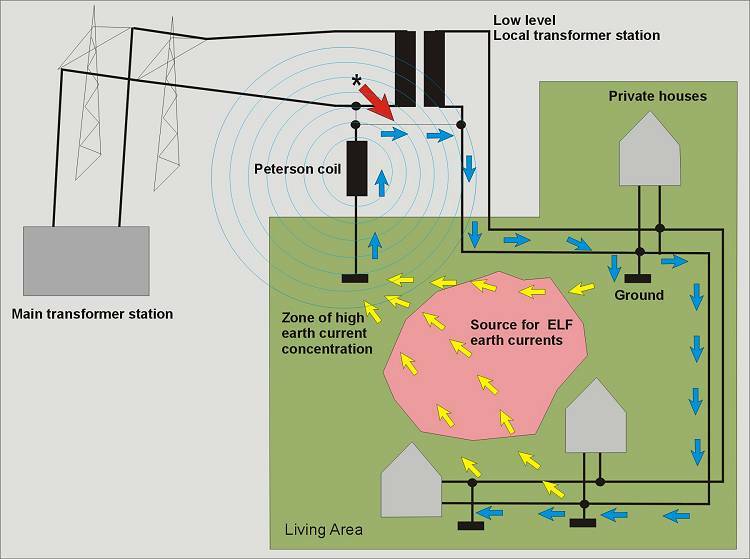 Image 1: If there’s a signal source between the ground of private houses and the ground of the Peterson coil, a current would be driven over the coil and one power cable leading to the houses. * (red arrow): At the given diagram, this would work only with a bridge between primary and secondary transformer coil. As already mentioned, in addition to the coil, the signals in question can also be received by two small metal sticks put into the ground (for only a few centimeters) at a distance of at least 1 meter. If you have access to natural ground from your lab, this may be much simpler and cheaper than constructing a coil with some thousands of turns. Comparing parallel coil and probes data, I found out that most of the signals can be detected with both recording methods. In addition, there are some signals which only appear in the coils data and some signals which are only present in the probes files. As the signals of the probes are much clearer and much more interesting, I focussed my research on recordings with probes since a while. As the signals of the probes sometimes have frequencies under 1 Hz, I resample them to a sample rate of 25 Hz. The frequency scale then reaches from zero to 12.5 Hz, which means, that the whole range of interest is spread over the whole Y axis. Image 2 and the following images will give you a few examples how these signals look like. Of very special interest is the “piper” between 2 and 4 Hz that reminds me to the sound of someone playing a flute. The signal consists of four different tones which are in a harmonic relation to each other and which are played successively. Sometimes (for hours or days) there’s only one note to hear, then again the notes are changing very fast, sometimes reminding me at the old “yankee doodle” melody. Typical for that signal is the fact that the frequency is not, like at all the other signals, straight and constant but shaky and trembling, as if the signal would be created by a manually driven power generator of such a low frequency and the operator sometimes gets a little tired. This signal is only present when using probes. When I discovered the signal at the first time two years ago, it was so strong that my receiver was nearly overdriven (image 5). After a few days the intensity decayed, and after another few weeks, the signal vanished again completely. Now since a few months it’s back, but not as strong as before and not as regular in its frequency. After all, there remains the big question: Are the earth currents that are detectable by probes responsible for the radiation of the Peterson coil, or is the magnetic radiation of the Peterson coil also responsible for these earth currents, which then would be a kind of secondary effect? The signals in question are also present in natural regions but only can be detected in populated places because of the presence of an extended and miles long net of metal pipes like water and gas pipes or the ground wiring of the electricity net. All this wide spread metal that is connected at one point to the Peterson coil works like a big “underground antenna”. Maybe if we had such a net of long wires buried under the ground in a natural area, we would receive the ELF-signals too. The only way to find out is to try it. But it is prohibited to dig such long ditches out in nature. Maybe some of the readers have a private area big enough to do this? Image 2: Three typical signals in the range below 4 Hz: “Piper”, “owl” and “foghorn”. Image 3: The siren signal appears at some days in late afternoon or evening. The signals shown above are also present at daytime, but then covered by strong disturbances at the same frequency range. Among other signals, at daytime there are long sequences of strong “heartbeat signals” described in my last article on vlf.it. The fact that these disturbing signals appear only during main working times may let you conclude that they have something to do with some machines used for work or some commercial devices. But in this case I also have to refer to the fact that they are not mentioned in any literature and that their frequency also doesn’t match with the ones that are used commercially. Image 4: Owl, piper and foghorn during a 4-hour period at a night in may 2013. Image 5: This image illustrates the high intensity of the piper signal when I discovered it for the first time in 2011. If you are interested in purchasing a receiver as described in the article (carrier-method), please contact the author for further information.